By the late 26th century, the overpopulation of Earth reaches the breaking point, forcing humanity to find new frontiers to call home. Knowing that this time would come, Earth has been in a centuries-long terraforming process of Mars, introducing moss and cockroaches to hasten the transformation. Three missions travel to Mars to see the results of that terraforming, and what they discover is the horror called Terraformars, giant humanoid cockroaches. As Terra Formars, Vol. 16 (Chapters 152 to 162) opens, the rescue ship from Earth, the “Frontier Spirit,” has finally reached Mars. The ship's crew is there to pick up the survivors of the Annex expedition, but there are also secret agendas at play. While the Chinese ship hovers above, the Frontier Spirit hurries to complete its mission. The object of everyone's desire, Joseph C. Newton, the perfect human, takes on all who would battle him and seek to make him a prize. 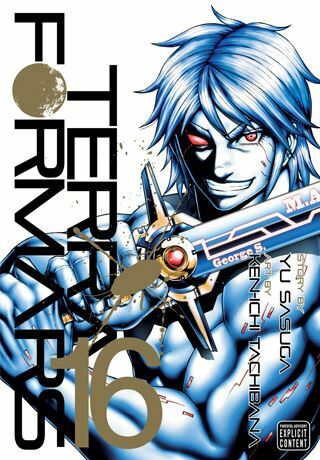 THE LOWDOWN: Perhaps, the Terra Formars manga seeks to move on from the horror of Mars, but it continues through this exceptional run in the series. The series has moved away from the humans vs. monsters scenario and gradually into human intrigue, while hinting at the mysteries of the past (or at least before the story begins). Terra Formars Volume 16 does offer one extended battle. It's pretty gory and will satisfy longtime fans of the manga who want monsters dismembering monsters. I really want more of the international intrigue that creators Yu Sasuga and Ken-ichi Tachibana have teased for several volumes, so I continue to see this as a series worth following. I READS YOU RECOMMENDS: Fans of seinen manga and monster comics will want to try the VIZ Signature title, Terra Formars.